I have a bit of a lipgloss problem. Well, maybe not so much of a problem as it is an addiction. You see, I feel I can never have too much gloss. 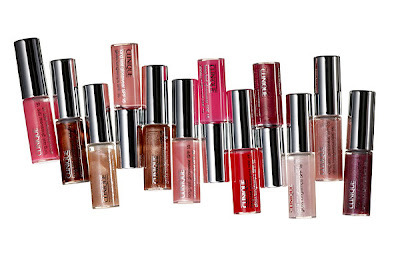 The more gloss, the better, in fact! So Clinique's High Shine To-Go set of 12 miniature Long Last Glosswear SPF 15 glosses is right up my alley. Not to mention the gloss is, well, unbelievably glossy. It glides onto the lips in a quick, fluid, super-smooth movement and lasts for hours. And I totally love the SPF 15 factor, since I'm always looking for ways to up my sun protection! While this gift set is no longer available, you can purchase all of the various Clinique High Shine Long Last Glosswear SPF 15 lipglosses for $16 each at sephora.com.